I have been making a real effort to try out some of the things I have owned for a little while but haven't got round to using-so many products, so little time! This is my second on the 'x 9' palettes from MAC-Amber x 9 is pretty much my most used palette this year-I reviewed it here and I love it for it's range of shades and for it's convenience-I think it has been on every single trip I have taken since I bought it. Yes there is nothing groundbreaking in the content of the palette but it's just one of those palettes that you cannot go wrong with. I would recommend it to anyone. I was hesitant to buy Burgundy x 9 because I already own 7 of the 9 shades in the palette but as you can see I did buy it because a) I figured it was a really well put together palette b) it would be handy for travelling (my rationale for everything) c) mini dinky sizes are life and d) I am weak willed. But it's turned out to be an awesome purchase, especially for the winter months when I just want to wear something a little warmer on my eyes. I have been obsessed with this palette the last week and it's all I have worn-I have been in love with Quarry/Haux or Poppyseed for the crease and a combination of Honeylust/Star Violet or Antiqued on the lid with Sketch to smoke things out a little on the outer corner. The colours are pigmented and last all day on me on top of an eye primer. In comparison to the Too Faced Chocolate Bar palette that I reviewed last week, the formula of this wins hands down. Yes there is more versatility in the shade tone in the Too Faced palette but everything just works in the MAC version. 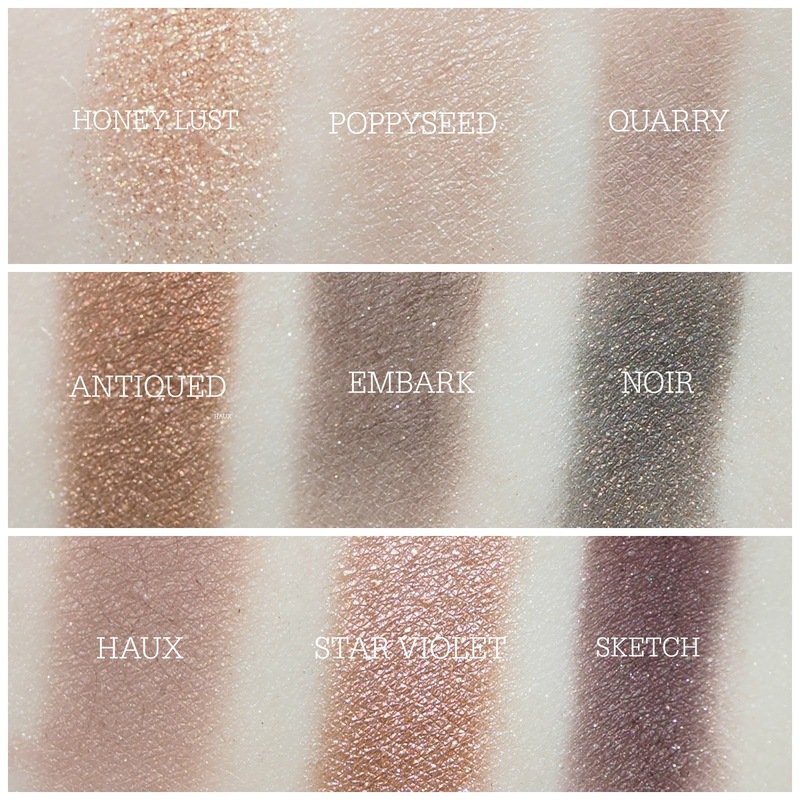 Poppyseed and Noir are the only shades I didn't already own and are the only two limited edition shades in the palette, the rest can be bought as individual shades. I feel like my swatch of Star Violet doesn't show how pink toned it is-but you can see another swatch here from my previous Pro Palette post series. If I could change anything about this palette I would have liked them to drop Embark and replace it with Swiss Chocolate for a warm matte brown and drop Poppyseed and put Cranberry in it's place because Haux/Quarry and Poppyseed are all taupy mattes and quite similar (but so wearable!). I am really pleased I bought this palette-it's definitely coming home to the UK with me next week and definitely gets 'rave review' status on this blog! Have you tried any of the x9 palettes?